Hi, I have a 2003 Land Rover Freelander and I'm trying to change the ECT( Engine Coolant Temperature Sensor). My Freelander is overheating and the fans are not turning on when its getting hotter. My radiator fans work well since they do turn on fine when I turn on the A/C. I can't seem to find the sensor. I can definitely provide pictures of my engine bay. I offered the advice on this link and got a resistance of 4.3, seems well within specs. The sensor has a part number of: WT5165 is made by BWD - Engine Management Technology. That sensor is the right place to start as it is the most likely problem. Here is a picture showing the location. It is on top in the front center of the engine. Hey, the sensor that I purchased looks a bit different from that one in the diagram, the biggest thing is mine has 4 pins and the one in the diagram has 2 pins. You're saying top front center, I see what looks like a valve cover on the left. Sorry I'm having a hard time spotting it.Sorry, I mistyped it, I meant a timing chain cover not a valve cover. on the left of the picture. That is a timing cover on the left as looking at it from the front. Hey, I'm sending you a picture of my engine bay. This still isn't very clear. Here's an additional one, a little more upper view. Go to the front of the engine, to the left of the alternator. not the front of the car. Sorry, I was not clear on that. The hoses and wire looms aren't there. I'm in the midst of removing my alternator to verify below it but do not see any harnesses nearby, do I have to remove the alternator?Additionally you didn't tell me if the sensor I purchased is actually the correct one. I've been waiting on help from someone else and no response yet. Experience: Hi, I have been a Car/vehicle mechanic 34 years. 29of -running my own repair/diagnostic business. Hello - and Welcome to justanswer..
Im sorry you have had a wait .. 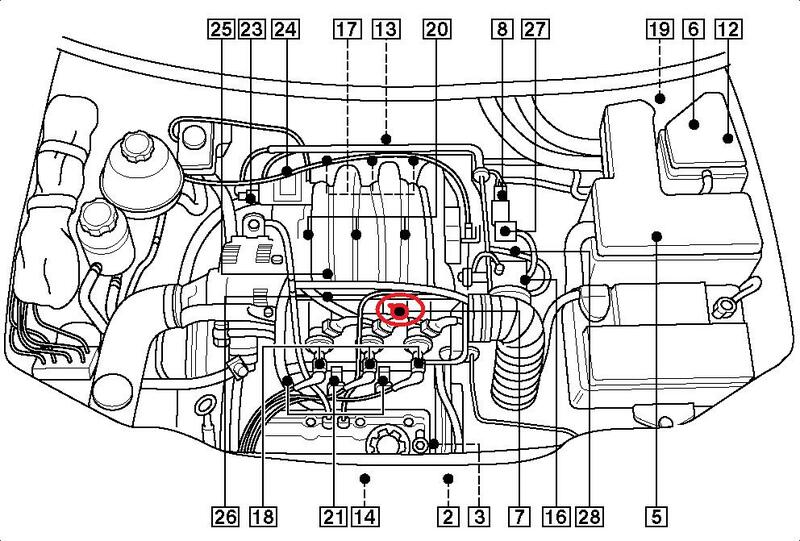 If you look at the vehicle / engine - from the front of the vehicle - viewing the engine - the Ect sensor you will see is screwed into the block , just to the right of the centre of the three injectors. To help you - I have uploaded a drawing for you - (below ) the Ect location is shown as item 7 in the pic - I have highlighted in in red for you. .Kind Rgds to you - MIKE. Hey, thanks for taking the time to respond. it looks like a very nice diagram but it's not there. The biggest thing is mine has 4 pins and the one in the diagram has 2 pins. Did I receive the correct sensor? Thank you for your reply - give me a few mins and I will double check this for you . 2002 Land Rover Freelander V6 2.5L. Just put a used engine in it.